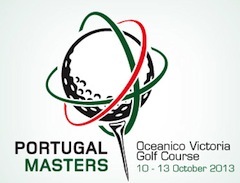 I was a lucky invitee to the Portugal Masters Pro-Am at Victoria Golf Course in 2013. I received the invitation a few weeks in advance and immediately began a practice regime to ensure I wouldn’t let the side down! I was a guest of the Tourist Board and on arrival I, together with their other guests, was accommodated in a very nice Hotel close to the golf course. The other guests were also Golf Tour Operators, from the UK, Germany and Sweden. In addition we had Luis Figo, the most revered footballer in Portugal as part of our group. The night before the Pro-Am our hosts had a drinks reception and dinner organised together with the very exciting news of who we would be playing with. They told us that they had allocated spaces with Martin Kaymer, Jose Maria Olazabal, Scott Jamieson and Francesco Molinari. There was palpable excitement when we heard we would be playing with some of the elite of the European Tour. 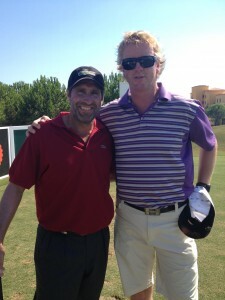 The ‘draw’ followed and I was delighted to be placed in the group with Olazabal. The next day dawned with beautiful sunshine as we made our way to the course. The practice area and putting green were filled with the top European stars, their coaches, managers and equipment suppliers. Dennis Pugh and Pete Cowan were there tweaking some of their pupils swings. Equipment suppliers were dispensing balls and equipment to their players and if you saw what they were getting you’d understand why we pay so much in our local shops! In my group together with Olazabal were two Swedish Golf operators whom I had met the night before. Naturally, their English was perfect and we got on famously. We made our way to the 10th tee, our first, to be introduced to Jose Maria. On introduction he repeated everyone’s name; I presume having played in so many of these events it would be easy to forget the ‘Am’s’. We all hit reasonable tee shots, which eased the first tee nerves just a bit. Strolling down the fairway Jose Maria engaged us all in conversation showing a genuine interest in where we were from and where we played. His caddy, David, who is a teaching professional, was very engaging and chatty. I asked JM what we should call him and he immediately said that everyone calls him ‘Ollie’. As soon as we got to our first green Ollie got involved in the lines of everyone’s putt and read the lines for all. This continued for 18 holes. I was surprised at this because having played in many Pro-Am’s previously I hadn’t witnessed this with other Pros. Ollie spoke about his fond memories of playing in Ireland and was familiar with my home course, the Royal Dublin. His ball striking was immaculate and he hit many arrow like long irons. His driving was very straight and although not as long as many, he hit most fairways. His putting was unbelievable. What was particularly noticeable was on ‘shorter’ putts from maybe 6ft in; he struck each putt firmly and confidently. We amateurs hit them so that when we miss they are not too far away but Ollie hit each putt firmly into the centre, and this was on fast greens! The highlight of the round was Ollie chipping close on the par 3 16th, facing a similar chip somehow I managed to chip in! Overall it was a fantastic experience playing golf with such a legend and gentleman. As it was towards the end of the season Ollie was returning to Northern Spain where he would winter and go shooting with his Dad. John Bergin is the founder and Managing Director of Skytours and Golf Breaks. John is a keen golfer and plays regularly at The Royal Dublin Golf Club. John’s travels have brought him to many corners of the world and invariably the golf clubs travel with him. Never one to refuse a game of golf John lists Portugal as his favourite short haul destination for golf and when travelling further afield he thinks its hard to beat South Africa.